Yesterday was the first day of the Google I/O 2010 Developers conference. During the keynote speech, Vic Gundotra (VP of Engineering for Google) was talking about HTML5 and how there are APIs to allow developers to create better web applications. A graph was then displayed showing past, present, and future adoption of these APIs by the common web browsers. Vic Gundotra goes on to say “So where do we expect to be by the end of this year? 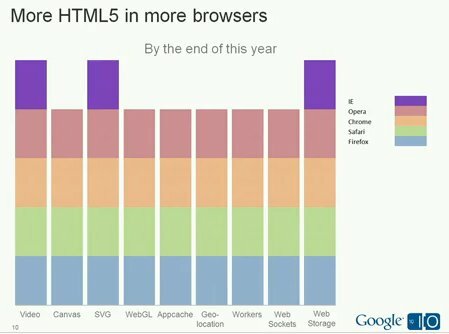 As you can see all the major APIs are going to be present in all modern browsers”. As you can see in the slide, IE doesn’t appear to be one of those modern browsers.